Chłonna i anatomicznie dobrze skonstruowana pieluszka z organicznej bawełny frotte. 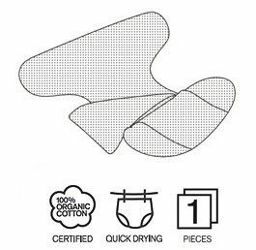 We are very proud to introduce an entirely new organic diaper, made of 100 % organic cotton. For the little ones Preemie size fit the very first period. The diapers have trims and snaps in 4 bright colors. They are soft, flexible, dry quickly and are easy to put on and take off. 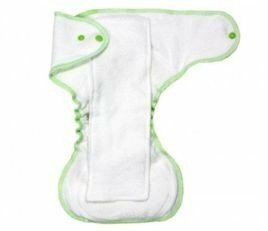 The insert is loose and not sewn together with the diaper, which gives you flexibility to choose not to use it, or take two when needed such as overnight or naptime. 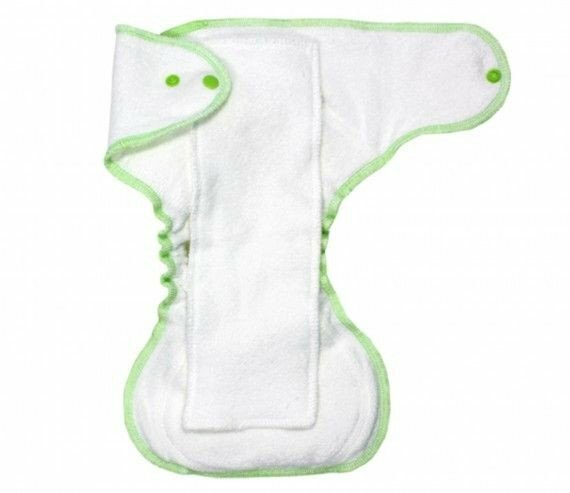 They have soft elastic around the legs for a snug fit and high absorbency. Use in combination with one of our popular diaper covers in sizes Preemie and Newborn. The trim and snap color may vary. The diapers are available in purple, pastel green, dark green or orange trim and if you want a specific color, type it in the comments box at checkout. Fajna pieluszka do codziennego użytku. Dosyć szeroka między nóżkami, ale wg mnie to dodatkowa zaleta bo zapewnia przy okazji szerokopieluchowanie. Ładnie leży i dzięki napom w różnych odległościach po obu stronach można ja dobrze dopasować.